The longer you live here, the more China starts seeping into everything you do. Here are 46 signs that your time in China is changing you. 1. The line between ketchup and marinara has blurred. 2. Cherry tomatoes and canned peaches are starting to look like reasonable birthday cake toppings. 3. Bunny ears, feather masks, and strobe lights are starting to look like reasonable Christmas decorations. 4. You’re truly fine with no ice in your drink. 5. When meeting someone new, you don’t shake hands, and you don’t expect to learn their name or tell them yours. 6. But you will probably add each other on WeChat. 7. Trains make you think of instant noodles. 8. You cringe when you have to walk across carpet in your shoes. 9. When you’re riding inside a vehicle, you have a strong urge to crack open the window “to improve air flow” no matter the weather. 10. Showering at night just seems right. 11. You fill other people’s cups before your own and put food in other people’s dishes. 12. When you’re invited over to someone’s house for dinner, you bring a big bag of fruit. 13. When you go with friends on a short hike, you bring along enough snacks for a week. 14. Tipping seems like a ridiculous concept. 15. So does the practice of buying all your groceries a week at a time. 17. 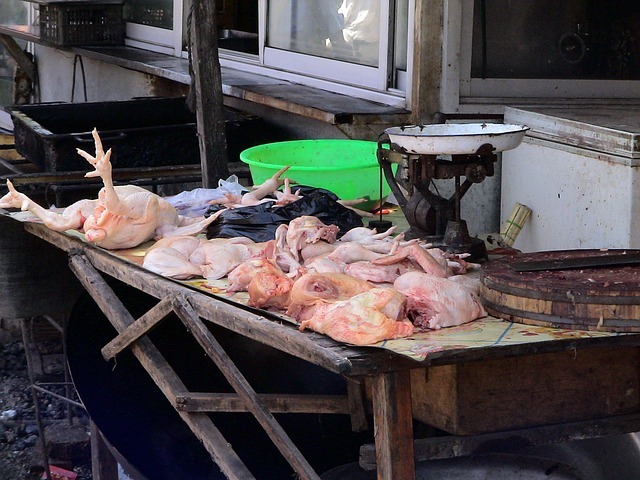 Seeing a skinned rabbit at the market makes you admire the stall’s impressive selection of meats. 18. Packaged meat and fruit make you suspicious. 19. You do want the fatty meat. 20. And the fish cheek. 21. Umbrellas make you think of sunny days, and sunny days make you think of doing laundry. 22. You know which animal this year is, and you know which one is coming up next, all without checking Baidu. 23. You balk at paying an extra five mao for cabbage. 24. You agree that ping pong is a real sport. 25. Toothpaste flavors back home seem really limited and uncreative. 26. So do pizza toppings. 27. You honestly prefer a squatty in public restrooms. 28. Red beans make you think of dessert; cinnamon makes you think of medicine; dates make you think of soup. 29. You can quickly assess the important differences between three different fake iPhones. 30. You have used the phrase “5000 years of history” in a non-sarcastic way. 31. When the food comes and it looks just like it did in the menu, you’re surprised. 32. During the battle to pay the bill, you know how to fight dirty. 33. You can use red plastic twine to fix just as many things as duct tape. 34. Shanxi and Shaanxi are clearly two different places. 36. Based only on hearing the name of the province someone is from, you can already accurately guess what ethnicity they are, what language they speak, and how they feel about spicy food. 37. Traveling with a tour group does seem like it would save a lot of mafan. 38. You can’t remember a good English equivalent for mafan. 39. While standing on the bus, you no longer get upset when a stranger leans on you. 40. Sometimes you’re the one leaning. 41 You point to your nose when indicating yourself. 42. You stare at other foreigners. 43. You don’t assume the toddler with a shaved head is a boy. 45. While traveling to a different part of China and someone asks where you’re from, you tell them the name of the province you live in. 46. Because, for at least part of your soul, China is home. Your blog is, hands down, my favorite blog about China. I have yet to achieve #4, and please, God, no, #37 can NEVER be true!!! #8 happens even when I see other people do it on television. And I have often marveled at how true #5 is, how irrelevant my name is here, and how few names I know. Just the other day I asked a friend what her son’s name was, after meeting them 6 months ago, because I want my children to stop calling him “bad tooth boy” in English (thankfully the family doesn’t understand English). And thank goodness for WeChat! It’s helped me avoid many an awkward situation where an iffy person wanted my contact information. #14 and 15 make me feel like I never want to go to the US again. I would be lost if I had to think more than 12 hours ahead about what food I wanted in the house. Same for #35. I’ve known people who seemed to leave the country without knowing they were going to do it the day before. And I’ve been doing #42 since I got here :-D. And I love #44. I don’t think I can ever leave! Thank you so much for your fantastic blog! BAD TOOTH BOY! Love it. Yup, we’ve had a few nicknames like that for people. But monikers like “that one neighbor’s wife who we always see walking a poodle” get old after a while. I’m so honored that my blog is your favorite China blog. Thank you so much for reading and for commenting! I’m a Chinese who has never been to China. This list is funny! mafan is “troublesome” or “bothersome”. Thanks, Kathy! Trouble, bother, hassle, red tape, effort…lots of English words to choose from, but it seems like none of them really capture the full meaning of mafan. I think most expats in China just say “mafan” even when speaking English because it’s a great word! This is The Best. Just wait till you move back and try and readapt to your own culture–it’s been 5 years since I came back (I was in Ningxia for 5 years) and I STILL don’t like ice and line dry all my clothes! Haǃ These are great, Ross. And not just any long johns, but fleece/fuzzy lined ones. So much cozier than the wimpy, thin thermals back in the States, IMHO. Wow, thank you for what you’re doing with this awesome blog. I love it! Fun and truthful but POSITIVE. Thanks so much for that encouragement, Brad! Too funny and yes that’s some essense of living in China. Thanks, Jennifer! I’m glad you enjoyed the post. We’re all in the same boat, eh?